Is I Can Have It a Scam? Read Reviews! Prizes: Cars, motorbikes, holidays, electronics, etc. 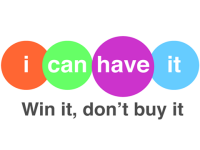 ICanHaveIt.com is a game site where players buy tickets to win prizes. There is a heap of options on things to get but – yes the big but – it all costs. Buy four tickets and you do get one free but again, it all costs money. Why do they do it? It looks like a gimmicky advertising site to get you to look at stuff and possibly want it. Well, I admit the BMW did draw my attention to win prizes but then I had to look further. So what are my odds of winning? Each of the competitions has different prices and they all cost. The range to buy tickets for the prizes are from £1 and £5 though there is a free ticket for each 4 purchased. The competitions also have different close dates anywhere from one month to six. Each of the competitions does have a limited amount of participants though it does take time to drill down and find out the amount. Anyone can play here as long as you are over 18 years of age and/or comply with the rules of where you live. It is the UK based hence the competitions are run on the rules and regulations of England and Wales. What Are the Prizes Offered by ICanHaveIt.com? The prizes are really diverse including cars, motorbikes, holidays, electronics, stuff for the house, gadgets, fashion, jewelry, watches, beauty, sport, weddings, experiences, food and gifts. The irritating thing is that they don’t actually publish when the competition is over. And each option to play costs money. There is a free play for a monthly competition for a £10 for any of the competitions offered. Refer a friend and you get a free ticket though it doesn’t say for what prize. Ever heard of Key Criteria Technology? They are a software company out of the UK that runs ICanHaveIt.com. There are a snail mail and email address plus phone number. ICanHaveIt.com says they guarantee a winner for each competition. Competitions stay open until either all tickets are sold or they impose a time frame – their choice. Any winner will be published on their site for at least 30 days. Players have to consent to have their picture and info published. Oh, and players do have to answer a multiple choice question. Each of the prizes has their own terms so it is important to check them out. Winners will be contacted by telephone and email within seven days of the close of the specific competition to arrange delivery of your prize. Delivery is free anywhere in the “mainland” UK. Winners are responsible for the cost of delivery anywhere else including any import duties and taxes – including “road tax”. Guess they are referring to that BMW. Reading some of the published comments, there seems some doubt on whether the big prizes are actually won. Definitely, there have been winners, but it seems more of the small prize items. Is I Can Have It Scam or Legit? This looks like a fairly straightforward game site that costs to play and win different prizes. It would be nice to see that someone had actually received a car or that Alaskan trip. Would you mind rating ICanHaveIt.com? I would definitely be more confident going for that BMW if they told me how many tickets were being sold and when the draw closed. Overall, this site feels like a place where ICanHaveIt.com gets you to look at different merchandise on behalf of manufactures. When Does the Competition Close – Any of Them? How Many Tickets are Sold for each Competition? Delivery Costs for Anyone Not in the UK? Has Anyone Won A Car? This site doesn’t get a thumb’s up or down – given it’s been around since 2016, someone has to have won a car or an amazing trip. Why isn’t this on their website?